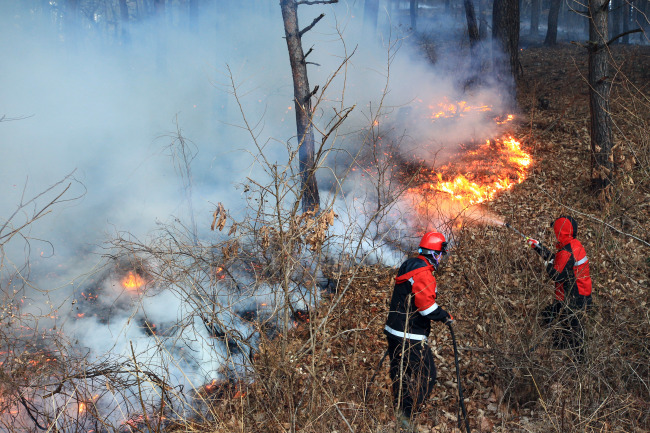 A forest fire that broke out in Yangyang, Gangwon Province, on Tuesday burned about 20 hectares of forest in two days, forcing the evacuation of 297 residents from the area. The fire department and forestry authority dispatched 24 helicopters and 1,600 personnel to extinguish the fire. The major fire was put out at around 12:15 p.m. Wednesday, about 20 hours after it began. The authorities were working on extinguishing small flames and preventing additional fires on the same day. 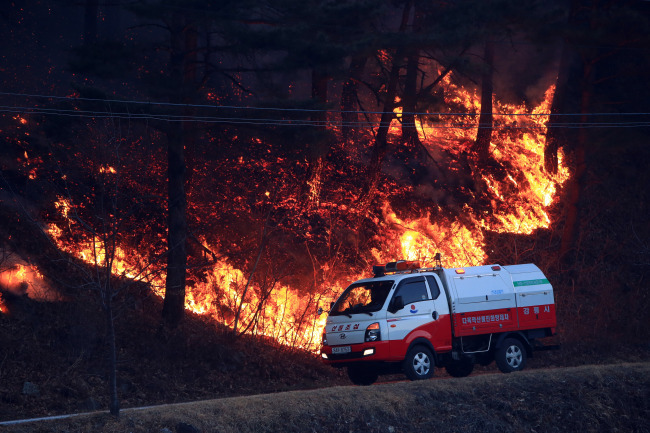 No casualties have been reported, but a total of 297 people living in Songcheon-ri and Sangpyeong-ri had to evacuate to shelters set up in a school and a village hall. The residents returned to their houses after the fire was extinguished. The fire started on a hill in Songcheon-ri, a small town in Yangyang, around 4:12 p.m. Tuesday. 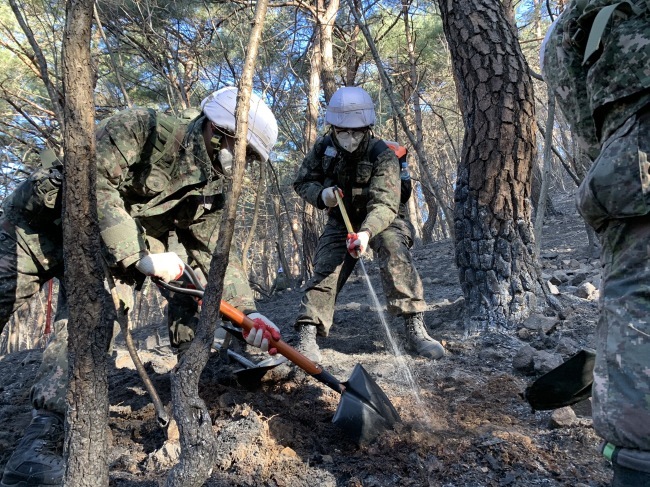 The authorities dispatched 677 firefighters, police officers and government employees to put out the fire, but they struggled to fight the fire because of the rough mountain terrain and strong winds. Helicopters were pulled out from the operation after sunset, leaving firefighters to focus on preventing the blaze from spreading during the night. “We’ve faced difficulties in extinguishing the fire due to the heavy winds and dry condition, but we managed to put out the fire. We’ll make every effort to extinguish small flames and check for the possibility of additional fires occurring,” said the forestry authority. As of 11 a.m. Wednesday, the Korea Meteorological Administration had issued a drought warning for the east coast of the Korean Peninsula, including Yangyang and Gangneung in Gangwon Province. In 2005, a fire that continued for 32 hours engulfed Naksansa, a Buddhist temple with around 1,300 years of history.